Progress M-09M (Russian: Прогресс М-09М), identified by NASA as Progress 41 or 41P, is a Progress spacecraft which was launched in 2011 to resupply the International Space Station. It was the ninth Progress-M 11F615A60 spacecraft to be launched, and has the serial number 409. The spacecraft was manufactured by RKK Energia, and is operated by the Russian Federal Space Agency. 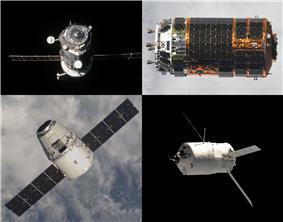 It arrived at the space station during Expedition 26, and undocked during Expedition 27. Progress M-09M was launched from Pad 1/5 at the Baikonur Cosmodrome, on 28 January 2011 at 01:31:39 UTC. The launch used a Soyuz-U carrier rocket, which placed the Progress spacecraft into a low Earth orbit with a perigee of 193.5 kilometres (120.2 mi) and an apogee of 254.6 kilometres (158.2 mi), inclined at 51.65 degrees. The Progress spacecraft subsequently raised its orbit, and manoeuvred to rendezvous with the space station. 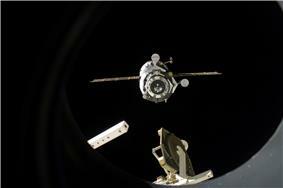 It arrived at the ISS on 30 January 2011, successfully docking to the nadir port of the Pirs at 02:39 UTC. Progress M-09M is carrying 2,666 kilograms (5,878 lb) of cargo to the space station, consisting of 1,444 kilograms (3,183 lb) of dry cargo, 752 kilograms (1,658 lb) of propellant, 50 kilograms (110 lb) of oxygen and 420 kilograms (930 lb) of water. Of the fuel aboard the spacecraft, 250 kilograms (550 lb) are reserved for orbital manoeuvres whilst docked, such as raising or lowering the station's orbit, whilst the remaining 502 kilograms (1,107 lb) will be used for refuelling the station itself. The dry cargo aboard Progress M-09M includes parts for the oxygen and water supply systems and the thermal control system, as well as equipment for hardware control and the station's electrical and telemetry systems. Also aboard the spacecraft is 147 kilograms (324 lb) of equipment for conducting scientific research aboard the station. For the crew, food, medical and hygiene equipment will also be delivered, as well as documentation and personal items including books by Konstantin Tsiolkovsky and a birthday present for station commander Scott Kelly. The Kedr miniaturised satellite was delivered to the ISS aboard Progress M-09M. It is an amateur radio satellite which will be deployed from the station during an EVA on 16 February. The satellite will be operated by RSC Energia, and is part of the RadioSkaf programme. It is intended to commemorate the fiftieth anniversary of the Vostok 1 mission. Total cargo mass delivered: 2666 kg. Progress M-09M departs the ISS on 22 April 2011. 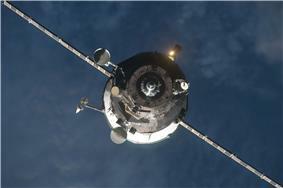 Progress M-09M was undocked from the Pirs module at 11:41 UTC on 22 April 2011. After departing the space station, the spacecraft was used for Radar-Progress scientific experiment to investigate a reflection feature of the plasma generated by operations of the Progress propulsion. Upon the completion of this experiment the spacecraft was deorbited, and reentered over the "spacecraft cemetery" in the South Pacific ocean. The deorbit manoeuvre was performed on 26 April 2011, with debris falling into the ocean at 13:23 UTC. ^ McDowell, Jonathan. "Satellite Catalog". Jonathan's Space Page. Retrieved 30 November 2013. ^ a b c "Рrogress M-09M Cargo Supplies". Russian Federal Space Agency. 29 January 2011. Retrieved 29 January 2011. ^ "ISS On-Orbit Status". NASA. 28 January 2011. Retrieved 29 January 2011. ^ "ISS On-Orbit Status". NASA. 30 January 2011. Retrieved 10 February 2011. ^ Ray, Justin (27 January 2011). "Russia launches another cargo ship to space station". Spaceflight Now. Retrieved 29 January 2011. ^ a b Harding, Pete (27 January 2011). "Progress M-09M launches to stowage-laden ISS". NASASpaceflight.com. Retrieved 29 January 2011. ^ "Kedr Smallsat Launched on Progress for Deployment by a Cosmonaut During EVA". SpaceRef. 28 January 2011. Retrieved 29 January 2011. ^ Russian Federal Space Agency (29 January 2011). "Progress M-09M Cargo Supplies". Retrieved 4 February 2011. ^ NASA (23 April 2011). "NASA ISS On-Orbit Status 22 April 2011". SpaceRef. Retrieved 27 April 2011. ^ "Progress M-09M Departed from the ISS". Russian Federal Space Agency. 22 April 2011. Retrieved 27 April 2011. ^ RIA Novosti, "Russia's Progress M-09M Spacecraft To Be Sunk In Pacific", 26 April 2011. ^ "Progress M-09M was Sunk in the Pacific". Russian Federal Space Agency. 26 April 2011. Retrieved 27 April 2011. Signs † indicate missions failed to reach ISS.